Can a machine tool acquisition change the way a 50-year-old shop approaches production? When it’s a fiber laser system that reduces processing time more than 90 percent—cutting with air-assist gas at a fraction of the cost of nitrogen—the answer is clear. Figure 1. The Cincinnati Inc. CL-940 Fiber Laser allowed Doyle to reduce processing time on components. Doyle, which has a second manufacturing operation in Palmyra, MO, is a four-generation, family-owned-and-operated company that manufactures quality dry fertilizer blending, conveying, tending, and spreading equipment. The company was founded by the late Merle Doyle, an innovative leader in the fertilizer equipment business, and has been the leading manufacturer of bulk blenders for dry fertilizer since introducing the first rotary-style drum blender in 1961. Today, Doyle’s 150 employees manufacture dry bulk material handling equipment for a worldwide customer base in the dry fertilizer industry, and its vertically integrated product line includes conveying, blending, tending, and spreading equipment. The company produces more than 11,000 parts, with annual quantities ranging from a few to more than 10,000 pieces. More than 90 percent of the company’s parts—primarily stainless steel—are processed through lasers, so highly productive laser cutting is a key to its cost-efficient operations. Most laser cutting of stainless steel employs high-pressure nitrogen gas injected coaxially with the laser beam to blow away molten metal without leaving any oxide formation on the as-cut surface. This is an excellent means, although more costly than conventional oxygen cutting. An alternative to pure nitrogen is the use of filtered shop air, which is composed of 78-percent nitrogen. Laser cutting with filtered, compressed air can be faster than cutting with oxygen or nitrogen—typically 300 to 320 ipm—and although there is an initial investment in the proper equipment, filtered, compressed air costs less in the long term due to its lower cost compared to “traditional” assist gases. The laser energy is brought to a tight focal position and introduction of compressed air creates a plasma ball at the surface of the material, similar to that created by a CNC plasma cutter using electricity. The plasma transfers heat more effectively than the beam alone. Figure 2. Doyle added a filtration system that supplies 350-psi-regulated clean, dry air. Compressed air-assist cutting also produces an edge quality about the same as parts cut with oxygen or nitrogen. Edges are clean enough for most powder coatings to adhere, eliminating the need for secondary cleaning operations. When compressed air was first used for laser cutting, resonator size was a major limitation. However, high-wattage lasers—those 4000W and above—now make air assist an efficient method for cutting steel, stainless steel, and aluminum up to 1/8 in. thick. Lasers with 6000W resonators can cut material up to 3/8 in. Rumple and the team at Doyle were aware of the possibility of cutting with air assist on a fiber laser, and saw it firsthand in a training session at Cincinnati Inc. “We saw it was possible, but didn’t know which materials and thicknesses it would work best with,” Rumple says. “We also thought the low pressure of shop air would be a limiting factor, so we decided to do test cuts with breathing-quality air to see if we could make it work.” Using its existing shop air at 100 psi, the company added filtration with a refrigerated dryer that feeds a high-pressure booster (450 psi maximum) to a high-pressure receiver, filters, and a refrigerated dryer, which ultimately supplies 350-psi-regulated clean, dry air to the machine. “We did five hours of test cuts on all of our various parts and materials and were very pleased with the results,” Rumple says. “Our main concern is the weld quality after the part is cut. We need a nice, clean edge for a good weld, and those processed on the fiber laser with air assist welded perfectly.” Doyle now cuts all its 18-gauge through quarter-inch 304 stainless steel, and 14- through 10-gauge mild steel using high-pressure air assist. The fiber laser also gets limited use running on oxygen, cutting quarter-inch mild steel used in fixture work. “Ninety-five percent of our fiber laser cutting is stainless steel using shop air,” he adds. The fiber laser system was not Doyle’s first Cincinnati machine. The company’s “partnership” with Cincinnati started in the late ‘90s, with the acquisition of a 230-ton press brake to bend formed parts up to half-inch mild and stainless steel. Since then, the company has added Cincinnati 135- and 90-ton press brakes (one each) at its Quincy location and a 135-ton version at its Palmyra facility. In late 2011, a 5000W Cincinnati CO2 laser was added at this facility to improve throughput and cut lead times by bringing laser work back in-house. Figure 3. The new fiber laser cutting system saves money due to the lower cost of air compared to nitrogen. With air assist, the required compressor is only 15 HP. 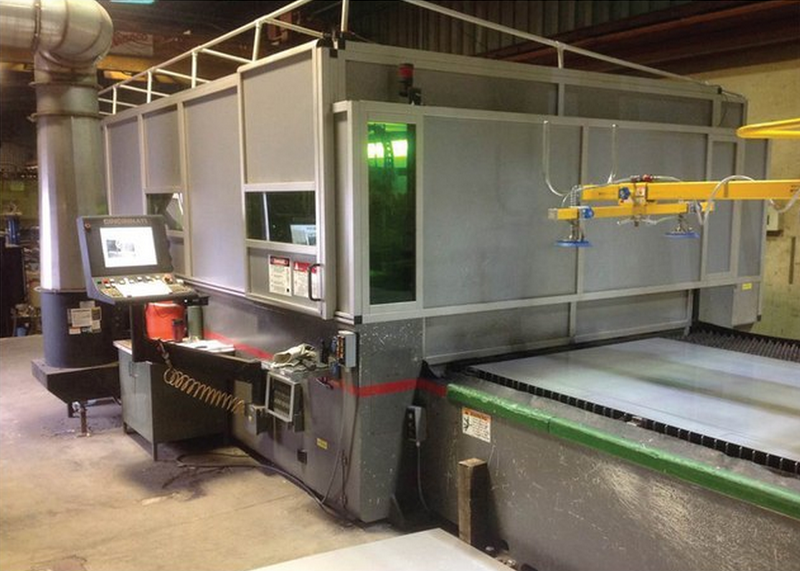 The success of operating the laser cutter using air assist has led Doyle to order a second fiber laser cutting system from Cincinnati set for delivery in July 2015. This will be housed in the company’s new 195,000-sq-ft. facility, also in Palmyra.